One would think that if you are dead you could expect a little security. One should indeed be guaranteed an eternity of that so-called everlasting peace. Not so for the people buried in the cemetery in Johnny Maxwell's town. The cemetery has been bought by a large multinational corporation and the remains of the cemetery's residents are to be placed in a necropolis. 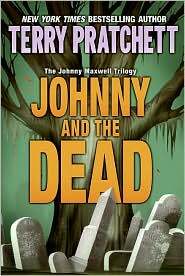 Normally this would not mean a great deal to Johnny Maxwell but when he finds out that he can see, hear, and interact with the dead, the future of the cemetery takes on a whole new aspect. The dead – they do not feel that they are ghosts – are livid about their upcoming eviction and they ask Johnny for help. Johnny can't help feeling that if someone in the cemetery was famous when they were alive, perhaps he will be able to convince the locals that the cemetery should be saved. Though Johnny and his friends don't actually find anyone famous for their cause, they do come to appreciate how important our history is. Meanwhile the no longer living decide to take matters into their own hands and the results of their efforts are quite startling. This deliciously funny and at times thoughtful story explores the idea that history is not just that boring subject that school children, more often than not, despise. It is not just a list of dates and names; history is our story, and the events in the past can have a profound effect on our present, when we truly learn to appreciate the sacrifices, losses, and triumphs of those who came before us. With wonderfully colorful characters and a surprising ending, this story is one which readers will remember long after they have read the last page. Though this title stands on its own, readers are sure to enjoy the other Johnny Maxwell books which include Only You Can Save Mankind.